What Guitar Strings Should I Buy? First, let's decide when we should change the strings on our guitar. Take into account the 4 D's (discolouration, decay, dullness and duration). Discolouration - the strings no longer look shiny or silver and are now black. Dullness - this takes only a bit of experience to hear, the guitar doesn't sound as bright as it once did, especially when you play a full chord. Duration - the string won't vibrate as much as it used to because of the dirt, therefore the sustain will suffer. 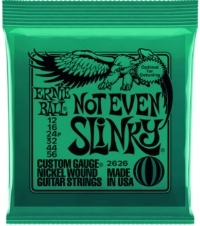 There are a lot of options when replacing strings on your guitar, and I`m going to guide you through the most popular brand, Ernie Ball (between £5-£7 per pack). From then on, you can experiment with different brands once you know what you are looking for. Strings come in different "thickness levels", called "gauge", and the lower the gauge number the easier they are to press down, bend, etc, but they are less likely to stay in tune when you press down and they are more likely to break . The higher the gauge number the less likely they are to break, they give a "thicker" or "richer" sound, but are more difficult to play, requiring more finger and wrist strength. After playing/experimenting you will have your favourite gauge and brand, but this will probably change constantly! You should not change your strings on the day of a performance, as the strings need time to stretch in, or you risk tuning issues. The day before should be fine. These are the lightest strings you can get hold of. Easy to bend the strings, easy to play and provide a bright sound. They are likely to break, and more difficult to control in terms of tuning as you can go sharp if you press too hard. Notable users: Chuck Berry, Yngwie Malmsteen (top 3 strings), BB King. Probably the second most popular gauge. Easy to bend and play, and provide a bright sound. The top string is most prone to break though. I would recommend these for Fender style guitars. If in doubt, go for these, they are a good starting point. Notable users: Mark Knopfler, Gary Moore, Joe Perry, Angus Young, Steve Vai, Joe Satriani. Probably the most popular gauge. 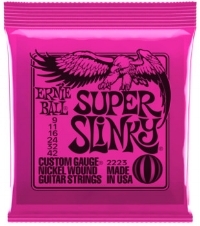 A little heavier than the Super Slinky strings. Harder to bend on the top three strings but provide a richer sound. Notable users: Eric Clapton, Zakk Wylde, Eric Johnson, Richie Sambora, Keith Richards. Work best on Gibson style guitars. Require a lot of strength but far less likely to go out of tune so you can strike the strings much harder than the lighter strings. The sound will be much "phatter" and "beefier" than the lighter strings. These are hard work though! You have to have fingers like Superman! Notable users: Keith Richards, Joe Bonamassa, Yngwie Malmsteen (bottom 3 strings). The capability for agile solos on the top three gauge 10 strings and big sounding riffs on the lower heavier three strings, you can hit the stings harder without going sharp. Requires some finger strength. Like Skinny Top Heavy Bottom but lighter. Agile for solos and beefy for those rock riffs, the best of both worlds. I have used these a lot. Requires some finger strength for the bottom three strings. A great progression from the Super Slinky. These are seriously heavy and not for the faint hearted. They have a big sound but they are incredibly difficult to play. Unless you have fingers on steroids (or you de-tune your guitar) I would avoid these! In between the Power Slinky and the Not Even Slinky. You will need some muscle in those fingers to get the best out of these. Suitable for de-tuning. These are seriously insane. For detuning the guitar. The only notable user: Stevie Ray Vaughan. Newer PostShould I Do An Exam? What's The Point?